Ecclesiastes 4:12 This scripture refers to a "Threefold Cord" which cannot be broken. That is the tie that binds George, Susan, and the Lord together. We are founded on Him and minister for Him and that cord keeps our family together. Our hearts' desire is to see people experience the REAL, TANGIBLE, PRESENCE of THE LORD thru WORSHIP and MINISTRY and to guide them into their destined place in the body. Through music, teaching, preaching,counseling, and business education we train up leaders. We welcome all opportunities and are available to teach leadership skills or lead worship when you need us. Check out our ministry page for seminar and ministry information. 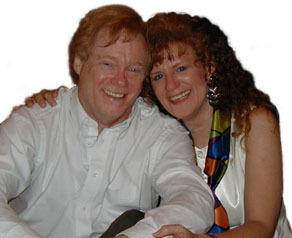 If you'd like to learn more about George or Susan just click on the picture and it will take you to their personal testimony page. Enjoy!